At Rainbow Club we believe in open communication with all our parents and staff. We set our prices to achieve an affordable charging structure that allows school to offer excellent provision at as low a cost as possible. We set our prices for the whole of the academic year so you are not faced with unforeseen cost increases during the school year. The Club is open 190 days during term time. The weekly and whole year costs above are shown for guidance and are based on a single child attending each club for the whole week. Please note that costs assume one child attending Monday to Friday. When you register your child for either breakfast or after school club, you are reserving a place for your required club on the specified days. The registration pack allows you to specify what days of the week you wish your child to attend. This information is used to determine the minimum required staffing levels and you are signalling your intent to pay the club throughout the year. You are charged per registered place and not the number of sessions attended. If your child does not attend a club every day there is the option, should you need it, to buy in “one off” or irregular additional days. This must be paid for and booked in, in advance. Same day bookings will not be accepted. Please note that this is not guaranteed and will be subject to sufficient free space being available in the club for the additional day(s) you require. Please see the Club Manager for further details. In the case of a late pick up a child (or children) from Rainbow club, school reserves the right to charge an extra fee of £5.00 for every half hour or part there of from 5.45pm. This is to cover staff overtime costs. Repeated late pick ups will jeopardise your place at the club. Short term illness absence will still be charged however payment will be rolled over to upcoming sessions, subject to discretion of Club Manager. Your places are for the 190 term days each academic year. The five staff training days (commonly called “Inset” days) are not included in the 190 days and are therefore not charged. You will not be charged for any other school closure days, such as those due to industrial action or bad weather when the Club is forced to close. If you wish to relinquish your registered place(s) before the end of the academic year, you must submit written notification to the Club Manager, providing four weeks’ notice. You must immediately settle all outstanding fees. Rainbow Club is self-financing and is run as a “not for profit” venture. Fees are used to employ the Club staff – salaries are not funded by the school – and to pay for food and activity resources. Any surplus is reinvested in the Club and may go towards school projects. It is very important that families pay promptly and do not accumulate arrears. With the exception of payment using childcare vouchers, you must pay fees in advance. Rainbow Club promotes a safe and positive environment for children. Children attending the Club are expected to behave and conduct themselves in accordance with school policies. 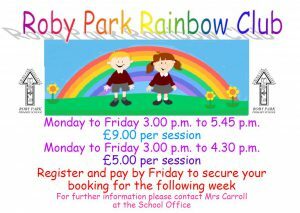 Rainbow Club has a rainbow zone system in place, in line with Roby Park Primary School’s ‘Promoting Positive Behaviour and Relationships’ policy. Not following the school’s behaviour and safety policies may result in the removal of your child’s place from the Club. If the person collecting your child is not registered as a named person, we require written notice giving permission for that person to collect your child. We will require a password and brief description of the nominated person.